The Sunny Farms (SFL) is located in Fostoria, Ohio, approximately 60 miles North of Columbus. SFL is a Subtitle D Landfill, in full compliance with the Ohio Environmental Protection Agency regulations, which began operating in 1994. The landfill is located on over 510 acres, and has over 100 million yards of permittable capacity. SFL is currently permitted to accept up to 7,500 tons per day. One of SFL’s greatest assets is that it is directly rail-served by the CSX. The facility is fully capable of processing over 65 rail cars per day. In 15 minutes or less, up to 100 tons of waste is unloaded from each railcar. SFL has one of only two enclosed rail unloading buildings, Tunnel Hill Reclamation Landfill being the other, within the State of Ohio. For SFL’s local customers, trucks are quickly processed over its truck scales. Most trucks are unloaded and leave the landfill within 15 minutes of arrival. For municipal solid wastes and construction & demolition debris no specific approvals are required prior to delivering wastes to the landfill. For contaminated soils and other specialty wastes profiles must be received and reviewed prior to approval and shipment to the landfill. Specialty waste is any waste material which, because of its physical characteristics, chemical makeup, or biological nature requires either special handling procedures and/or permitting, or poses an unusual threat to human health, equipment, property, or the environment. SFL can accept many types of specialty wastes profiles must be recieved and reviewed and supporting analyticals must be submitted in advance. For customer convenience, download our Waste Profile Form. 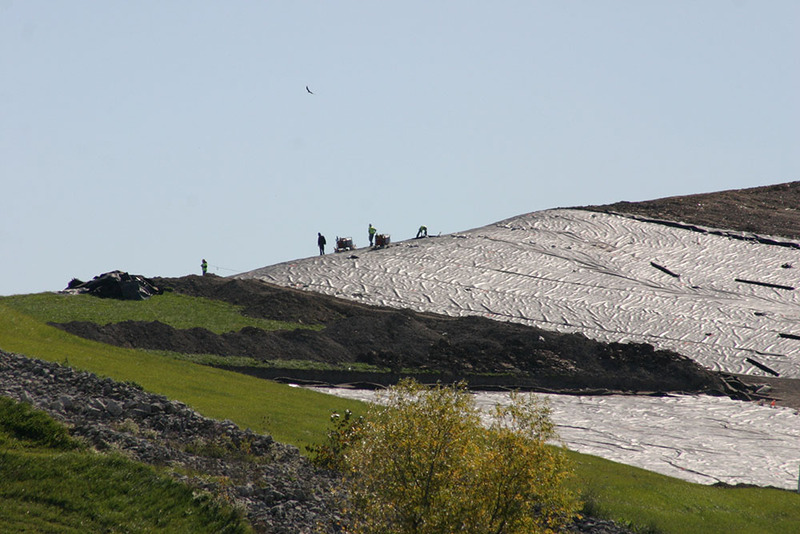 The Sunny Farms Landfill offers integrated solid waste disposal services and is directly rail-served, with over 9,000 feet of track on-site. The landfill maintains sufficient equipment to move and unload 65+ railcars per shift. SFL has one of only two permitted and enclosed railcar unloading facilities in the State of Ohio. Railcars are pushed underneath an overhead platform, where excavators unload the cars into high capacity off-road dump trucks that go directly to the active landfill face. This system of railcar unloading (compared with unloading from the side) is faster, reduces railcar damage and allows our railcars to be more efficiently emptied.